Ortega’s Appliance Service offers the best washer and dryer repair to Albuquerque and Santa Fe families. For more than 40 years, our extraordinary technicians have been providing exceptional appliance service and repair to hundreds of homes throughout the Albuquerque area. The loyalty, dedication, and dependability our company prides itself on has allowed us to flourish and become the first appliance repair service to receive the New Mexico Ethics in Business award. Our commitment to delivering the best customer service and results has also earned Ortega’s the 2015 Small Business of the Year award by the Small Business Administration. Though our expert technicians will provide you with exceptional service that will attempt to resolve your issue within a single visit, Ortega’s understands that every customer wants assurance that the problem will not reoccur. To put homeowners at ease, we offer a one year parts and labor warranty. For more information, please look into our warranty page. You can feel safe having our technicians visit your home. Our team of technicians are all background checked and drug tested. From the moment Ortega’s receives your call, we’re committed to resolving all of your washing machine and dryer repair issues in Santa Fe and Albuquerque as fast and friendly as possible. Our courteous staff will exceed your expectations and get your appliance back to working order as soon as possible. When our technicians diagnose the issue, there’s a good chance that they’ll have the repair part in their van, providing you with a quick and convenient installation. 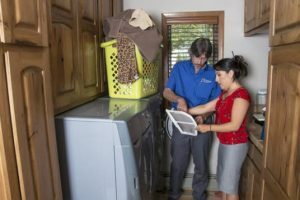 Whenever your laundry machines are not working properly, Ortega’s will deliver the washer and dryer repair Albuquerque homeowners have relied on for decades. Albuquerque & Santa Fe, NM area. See full list of service areas.